Leading marketing services company with global presence delivers creative, production and technology services to major multinational brands. The company leverages e-procurement technology and services to save time, reduce costs and streamline the procurement process for clients. 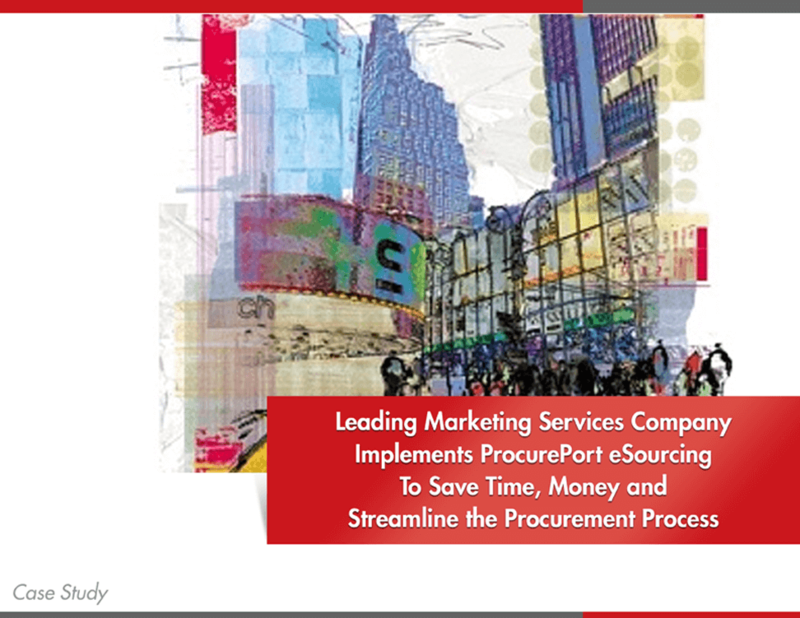 The Marketing Services company needed to integrate e-sourcing capabilities into its existing procurement process and then drive consistent usage across disparate global business units. Through its partnership with ProcurePort, the company quickly added a new capability that allowed it to deliver better value to its clients. With ProcurePort’s robust e-sourcing solution offering and its customization services, the company leveraged auction events to save up to 18% in cost of print services sourced from its network of suppliers. The company needed to streamline the procurement process and enable competitive sourcing for productive services. The company utilized an existing platform to procure services from its network of suppliers. 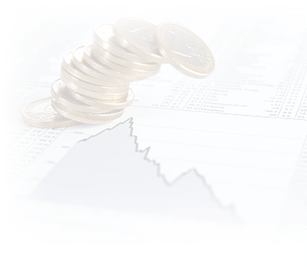 However, this system was designed to only manage the purchase order and requisitioning process and did not have the strategic sourcing capabilities needed to drive savings and improve efficiencies. 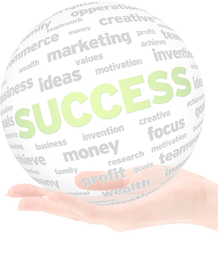 The company wanted to add e-sourcing capabilities to their procurement process. The ability to integrate e-sourcing into their existing platform was an important requirement, to ensure minimal disruption and continued utilization of their existing platform and capabilities. 1) ProcurePort demonstrated the ability to integrate their e-procurement solution into the client’s existing platform, by leveraging its core APIs and with basic customization to create a seamless user experience. 2) ProcurePort’s technology platform provided the advanced functionality that was essential to implementing the procurement requirements. For example, the capability to apply transformational bidding, using configurable custom fields and a powerful rules engine to execute events specific to the marketing services industry. 3) The ease-of-use of the ProcurePort platform would enable client to drive consistent and high usage of its new e-sourcing capabilities. 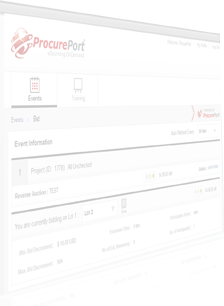 ProcurePort is a leader in providing cloud hosted e-procurement solutions and strategic sourcing services. 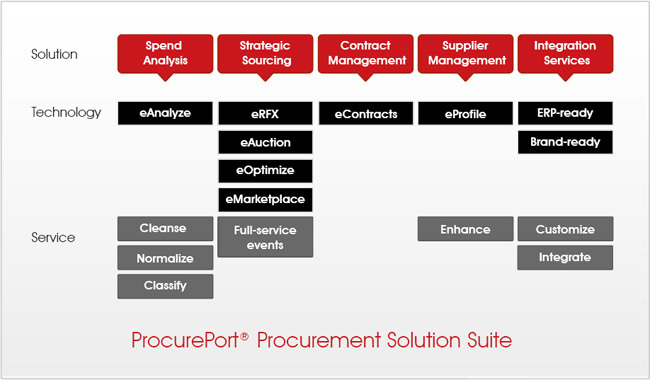 The ProcurePort® Procurement Solution Suite provides an easy to use, powerful, comprehensive and proven e-sourcing toolkit for organizations of any size. ProcurePort’s consulting services and flexible deployment options, enable organizations across a range of industries to improve spend management, automate processes and achieve procurement excellence. ProcurePort’s on-demand e-procurement solutions are cloud hosted in a Tier IV SSAE 16 Type II compliant data center, providing the highest level of data security and confidentiality. Sign up to receive strategic sourcing advice.